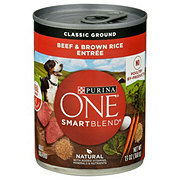 Indulge your dog's cravings for savory flavor with Purina ONE SmartBlend Healthy Weight Tender Cuts in Gravy Lamb & Brown Rice Entree adult wet dog food. This recipe is made with real lamb and brown rice, and 0% fillers means that every high-quality ingredient has a purpose. 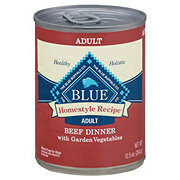 A delightful gravy balances out this wet dog food for added flavor and moisture. Our wet dog food formula helps your dog achieve and maintain a healthy weight for an optimal body condition, while the high protein helps to support his strong muscles. 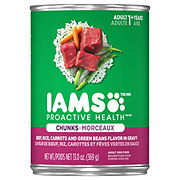 Tender, meaty cuts deliver a tempting texture your dog can happily sink his teeth into, and 100% complete and balanced nutrition in every serving helps to support his whole-body health. 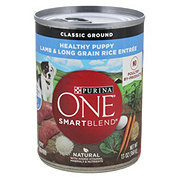 Use the chart as a guideline and adjust the feeding amount as needed to maintain your dog in ideal body condition Divide daily amount into multiple feedings. Your dog's needs may vary according to age, activity level and environment. Always provide fresh water in a clean container. Proper diet, exercise and veterinary care are the best ways to keep your dog healthy. 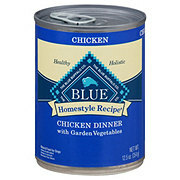 Daily Feeding Guide: Canned Food Only: 4 lbs weight; 2/3 can. 12 lbs weight; 1-1/3 cans. 20 lbs weight; 2 cans. 35 lbs weight; 2-2/3 cans. 50 lbs weight; 3-1/2 cans. 75 lbs weight; 4-1/2 cans. 100 lbs weight; 5-1/2 cans. 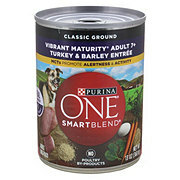 Canned + Purina One Dry Formula: 4 lbs weight; 1/4 can + 1/3 cup. 12 lbs weight; 1/2 can + 2/3 cup. 20 lbs weight; 2/3 can + 3/4 cup. 35 lbs weight; 1 can + 1-1/4 cups. 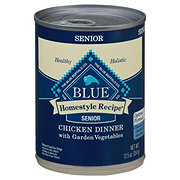 50 lbs weight; 1-1/4 cans + 1-2/3 cups. 75 lbs weight; 1-1/2 cans + 2 cups. 100 lbs weight; 2 cans + 2-1/2 cups. Refrigerate unused portion. Ingredients Primary Ingredients: Lamb and Chicken Broth, Liver, Lamb, Wheat Gluten, Pork Lungs, Chicken, Brown Rice, Carrots, Soy Flour, Corn Starch-Modified, Spinach, Egg Product, Essential Nutrients and Other Ingredients: Minerals (Potassium Chloride, Tricalcium Phosphate, Calcium Carbonate, Zinc Sulfate, Ferrous Sulfate, Copper Sulfate, Manganese Sulfate, Potassium Iodide, Sodium Selenite), Caramel Color, Vitamins (Choline, Vitamin E, Vitamin B-3, Vitamin B-1, Vitamin B-5, Vitamin B-6, Vitamin B-12, Vitamin B-2, Vitamin A, Folic Add, Vitamin D-3, Vitamin B-7). Crude Protein: Min. (10.0%), Crude Fat: Min. (3.0%), Crude Fiber: Max. (1.5%), Moisture: Max. (80.0%).